Alice Springs Chicken Flatbread - SO good!!! 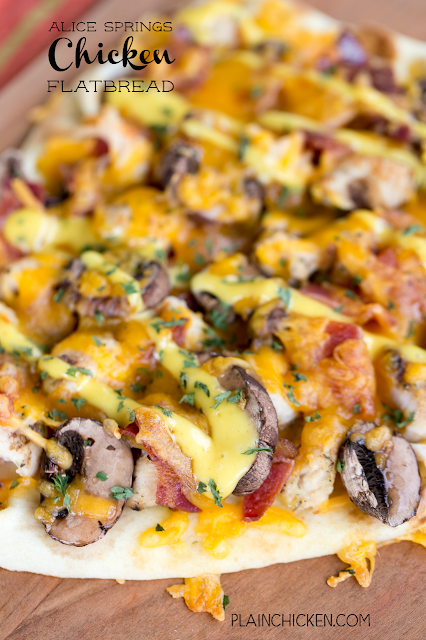 Chicken, bacon, honey mustard, cheddar cheese and mushrooms. This is a great way to use up leftover chicken. We made these twice last week! We just can't get enough of them!!! Easy weeknight meal! A fun change to pizza night. Flatbreads are one of our favorite weeknight meals. They are a nice change to our usual pizza night. Last week we made these Alice Springs Chicken Flatbreads. OMG! SO good!!!! In case you don't know, Alice Springs Chicken is a popular dish at the Outback Steakhouse. We haven't been to Outback in years, but I love making copycat version of the chicken at home. I just love all the ingredients - chicken, bacon, cheese, honey mustard and mushrooms. Heaven!! We use the Stonefire Naan flatbreads. I buy them in the deli/bakery section at the grocery store. They taste great and freeze wonderfully! We made these Alice Springs Chicken Flatbreads twice last week. These flatbreads are a great way to use up any leftover grilled or rotisserie chicken. If you aren't a fan of honey mustard, you could always swap it out for some BBQ sauce or Ranch. Spread 2 tablespoons of honey mustard on top of each flatbread. 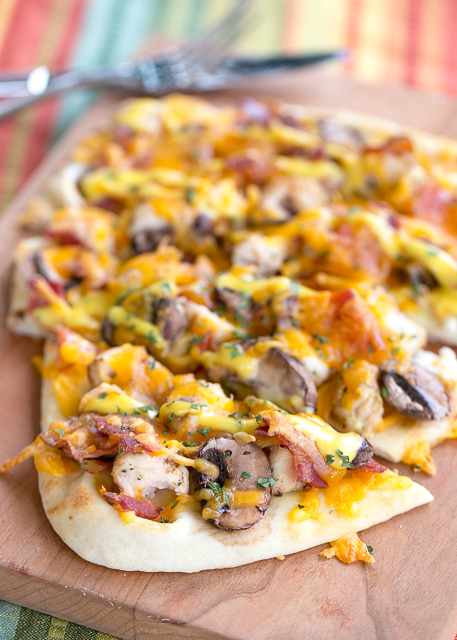 Top with chicken, bacon, cheese and mushrooms. Place on on baking sheet. Bake for 10 to 15 minutes. Remove from oven and drizzle with remaining honey mustard dressing. Hi! Looks great. What brand of honey mustard dressing do you recommend? Thanks. I like Ken's, Sweet Baby Ray's or O'Charley's in the produce section. This looks awesome! I agree, it is a good meal for the weekend.